Whilst there are many different leadership styles, everyone has a default leadership style that comes most naturally to them. Leadership styles determine how someone uses their power and authority to lead others. Your default leadership style then is the way you feel most comfortable leading others to achieve your vision. 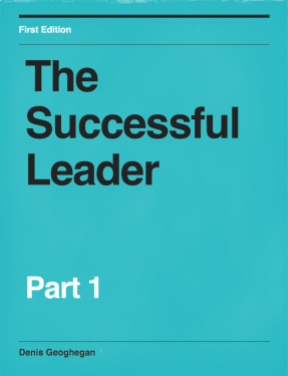 There are many different styles of leadership, and understanding which type you are will make you better equipped to avoid the common pitfalls of that particular style. The best leaders are able to adjust their style based on the situation they find themselves in, for example, turning around a failing organization might require a more forthright approach than being asked to grow an already successful organization. Let’s now examine the different leadership styles. Autocratic leadership is centered around and focused on the leader. With this style of leadership, all of the decision-making resides with the leader, and decisions are made by the leader without consulting subordinates. An autocratic leader will reach a decision themselves, communicate it with their team, and expect the team to execute, with no questions asked. With autocratic leadership, authority is in the hands of a single person, the leader. Examples of autocratic leaders include Donald Trump and Martha Stewart. Decision making is fast. With no consultation required the leader can make quick decisions. Improves performance in certain situations. Managers are motivated to perform due to a “leader is watching” feeling. Less stress in certain circumstances. For managers and other subordinates, it can result in less stress as the leader is shouldering all responsibility for outcomes. Frustrating for subordinates. Communication is one way which can be frustrating for subordinates. Fear and resentment are common as people don’t like being bossed about and criticized more often than praised. A paralyzed organization. The organization is paralyzed when the leader isn’t present, as the entire organization is dependent on the leader for instructions. New Opportunities Missed. Unless the leader keeps pace with new trends as time goes on, new opportunities could be missed. Additionally, the lack of flexibility in autocratic leadership doesn’t lend itself to planning for long-term initiatives. Communication Breakdown. Because directives flow downwards from the leader to the subordinates, misunderstandings and confusion can arise because of the lack of feedback that is allowed from subordinates. When quick decisions are needed. Autocratic leadership works best in situations where quick decisions are needed, such as turning around a failing organization. When close supervision is required. Autocratic leadership can work well when existing management is too lenient and workers are not pulling their weight. The autocrat will issue directives to be followed and the activities performed as a result of these directives will be closely followed. When workflows need to be streamlined quickly. Autocratic leadership works well when things just need to get done, and this style enables subordinates to get things done without worrying about the bigger picture. This explains why autocratic leadership is very common in the military. Democratic leadership (often called participative leadership) is focused on the leader’s team and is characterized by decision making being shared across the team. In stark contrast to the autocratic leadership style, ideas are shared freely and open discussion is encouraged. Although discussion is encouraged it is the role of the leader to guide and direct these discussions, and ultimately make a decision as to which way to proceed. Democratic leaders expect their subordinates to have in-depth valuable experience and to be self-confident. Examples of democratic leaders include John F. Kennedy and Larry Page. Decreased risk of catastrophic failure. As decisions are made with the involvement of the entire group, it provides a group check resulting in it being less likely for the leader to make a disastrous decision. Good working environment. Subordinates at all levels can feel engaged and take on the responsibility to challenge themselves because they are involved in decision making, and it is this sense of engagement that can lead to the creation of a good working environment and increased job satisfaction. High-performance teams. Subordinates are encouraged to solve problems under their own initiative, which in turn can create a higher performing team. This higher performance, in turn, leads to greater productivity. Slow decision making. By involving subordinates in decision making you can dramatically slow down decision making. This can be a real problem in situations where the organization needs to be turned around urgently, or where maintaining first mover advantage is necessary. Over-dependence on the team. A danger of the democratic leadership style is that the leader can become overly dependent on the group or hidden within the group, allowing the group to make the decisions. This can result in decisions being made which drift the organization towards its strategic goal rather than rapidly and purposely moving towards its goal. Collaboration burden. Leaders can become overly burdened with the overhead of ensuring experts meet and collaborate that they take their focus off key metrics and the urgent need to move towards the strategic vision. When subordinates are experts. Democratic leadership styles work well when working with subject domain experts, for example, technology experts or pharmaceutical experts. When subordinates are professionals. For an experienced and professional team, a democratic leadership style can bring out the best in them, by building on their existing strengths and talents rather than just expecting them to perform. When it’s necessary to create ownership. By involving the team in decision making and planning, you implicitly create buy-in to both the decision and the plan. This makes team members much more committed to the plan, and much more likely to overcome or workaround barriers to execution as they arise. A transformational leader is one who models the behavior they expect to see, sets clear goals, and has high expectations, whilst at the same time supporting and emotionally guiding subordinates to achieve. At the very foundation of transformational leadership is the consistent promotion of a compelling vision, along with a set of values to live and work by. Transformational leaders create a culture of no-blame where the focus is on the problem at hand and how to solve it, and not who is responsible for creating the problem. Examples of transformational leaders include Peter Drucker and Barack Obama. Transformational leaders are sometimes known as the “quiet leaders”, known for possessing a willingness to lead by example. They often don’t make detailed strategic plans, but instead, facilitate conversations between key people both within and outside of their organization to achieve this end. They know their followers and demonstrate concern and empathy for them. They motivate their followers to perform to their potential by inspiring them. They model the behavior they expect from others and are thus great role models. Balanced goals. Transformational leaders balance the need for short-term and long-term goals. Trust. Subordinates feel supported and deeply trust their leader because they behave with integrity and build strong coalitions. Vision focused communication. Transformational leaders are very focused on the long-term strategic vision, and by communicating the vision regularly with passion and clarity, they keep everyone on-side, bought-in, and motivated to reach it. Can be ineffective in the beginning. Transformational leadership is built on trust. Thus, transformational leaders can be ineffective at the start of their leadership journey as they have yet to obtain the trust of their team or build strong collaborations. Not detail orientated. Whilst transformational leaders are characterized by inspiring others, they can struggle with the detail of day-to-day implementation. When it’s necessary an inspiring long-term vision of the future. Transformational leadership works when you have a strong vision of the future and are willing to work within the system and bring diverse people together to make it happen. When the right to lead has been earned. Transformational leadership is often not appropriate when you’re new to an organization and both your leadership is unproven, and you’ve yet to build the necessary trust of your team. When an urgent short-term focus isn’t necessary. Because transformational leadership focuses so much on a vision for the future it isn’t appropriate when all the focus needs to be on the short term. Laissez-faire leadership is where the leader doesn’t actually lead the team but instead allows the team to entirely self-direct. This style of leadership is also known as the “hands-off” style, and in contrast to the other leadership styles we’ve looked at all authority is given to subordinates including goal setting, problem-solving, and decision making. From the leader’s perspective, the key to success is to build a really strong team and then stay out of their way. A common question people ask upon learning about laissez-faire leadership is “what does a laissez-faire leader do?”. Well, this will differ from leader to leader but typically they are more concerned with the creation and articulation of their compelling vision. They are also typically concerned with which steps to take to help achieve the vision. It is then obviously left to the team to work out how to achieve a particular step. Examples of laissez-faire leaders include Warren Buffett, due to the hands-off approach he takes in the companies he owns, and Andrew Mellon. A Laissez-faire leadership style typically works best near the top of the organizational tree where senior leaders appoint other senior leaders to run their respective departments and let them get on with it. Creates personal responsibility. Laissez-faire leadership styles challenge subordinates to take personal responsibility for their work and the outcomes of their work. Supports fast course corrections. Motivated people working autonomously are typically able to overcome roadblocks and adjust course far more quickly than when they need to seek approval. Supports higher retention. When successful it can result in higher retention as motivated professionals and experts thrive in their work environment which supports autonomous decision making. Lack of accountability. There is nobody accountable to take the credit in cases of success, or to take the blame in cases of failure. Higher stress levels. Subordinates can suffer from high levels of stress if they feel unsupported by their leader or unsure of their capabilities. Missed deadlines. Self-organizing teams without oversight or direction are prone to miss deadlines. When you’re working with creative experts. Use with creative professionals who have solid skills and lots of experience in their jobs. When people are proven. When your team has a proven track record of high performance and achievement on certain types of project. When your team is driven. When your team is motivated and driven to succeed on their own and are comfortable working without supervision. To make matters more complex, no two leaders will be exactly the same and may, in fact, have characteristics borrowed from other leadership styles to suit their needs. The following diagram can be really helpful in thinking about where different leadership styles have their main areas of focus. 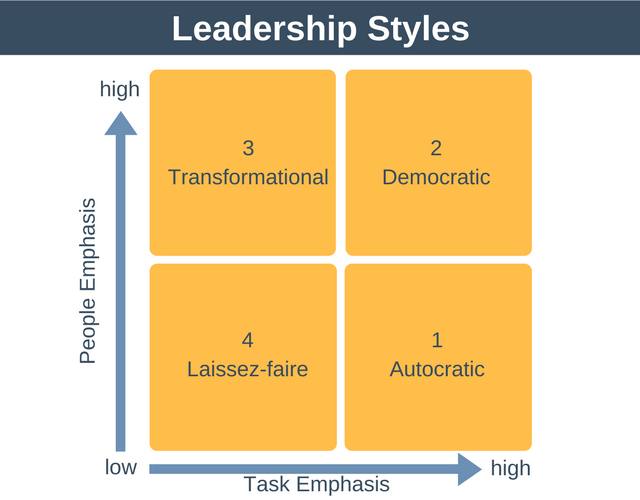 Autocratic leaders have a high task emphasis and low people emphasis. Democratic leaders have a high task emphasis as well as a high people emphasis. There is a reason the boxes in the diagram are labeled 1 to 4, and it has to do with subordinates. The higher the skill level of our subordinates the higher the box number and the more appropriate that style of leadership is for those subordinates, so autocratic leadership is good for people with a very low skill level, whereas laissez-faire leadership works for people with a very high degree of skill. Essentially, the leader’s behavior should change according to which quadrant the followers’ capabilities fall. Another point to note from this diagram is that the abilities of the leader, both in terms of soft and hard skills, must increase as we move from box 1 to 4. There are as many different leadership styles as there are leaders, but broadly they can be categorized according to the people focus and task focus. Although we’ve only looked at four styles in this article, the model described should help you to understand and categorize any of the leadership styles you encounter.